Tarkusian Cities, is, as the author puts it, an MD that is "always under construction". Begun on June 17, 2007, it is follows the travails of various transportation and land use authorities in several regions that Tarkus maintains, and numerous road construction projects, often complemented with frequent maps. Many of these road improvements also prominently feature as-of-yet unreleased transit modifications Tarkus is working for the NAM Team, such as new RHW and NWM features. To date, six total regions have been shown, Cascadia Gorge/Wakeman, Argentum (a carryover from Tarkus' previous MD/CJ attempt, Argentum), Los Endos, and Lenox, Chemeketa, and New Argentum. Except for the more verdant Lenox and Chemeketa, these regions are situated in an arid or semi-arid climate, often featuring Tarkus' own Wasco Terrain Mod, which was developed specifically for use in the MD. A few tutorials have been shown in Tarkusian Cities as well, including a tutorial on using the NAM Road Curve Puzzle Pieces (Update 3) and a tutorial showing how Tarkus makes his road maps (Update 21). 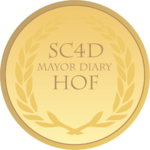 Despite being updated rather infrequently and its rather specialized approach, it remains one of the most viewed MDs at SC4D, reaching nearly 225,000 views since its opening. It has been OSITM on four occasions, first in October 2007, and was inducted into the MD Hall of Fame in December 2009. The less active ST edition of Tarkusian Cities won the 2011 Trixie Award for "Best Roadgeek City Journal", with over 90,000 views. This page was last modified on 27 May 2014, at 20:17.